The world today is based strongly around technology and it plays a large part in the lives of most people. The reach of technological advancements has also reached the automotive landscape and most drivers have come to expect features that highlight these advancements. 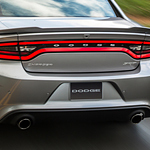 One trip to Crosstown Chrysler Jeep Dodge and you'll discover a wonderland of such features embedded in the 2019 Dodge Charger. The features that come equipped in the 2019 Charger will make driving around Edmonton a more enjoyable experience. If you are into music and entertainment, then you won't be disappointed by the Dodge Charger. There are three options to choose from. These include a six-speaker Alpine audio system, a nine-speaker Alpine audio system, and a state-of-the-art Harmon Kardon audio system that comes with 19-speakers. The media hub in the Charger comes with a USB port and auxiliary input jack. It is designed to sync all of your media files to the vehicle's touchscreen so that they are easily accessible.